Clear Plastic PET Cups or PETE Cups are a great way to show off specialty mixed drinks as well as help increase safety at any outdoor event. Clear Plastic PET Cups are the answer to your problems! These plastic cups or plastic cups with lids come in many different sizes and are the perfect disposable cup that are inexpensive but pack a punch for company branding. Let us brand your printed pet cup for your next company picnic or to go cup for your customers that never stay in one place. 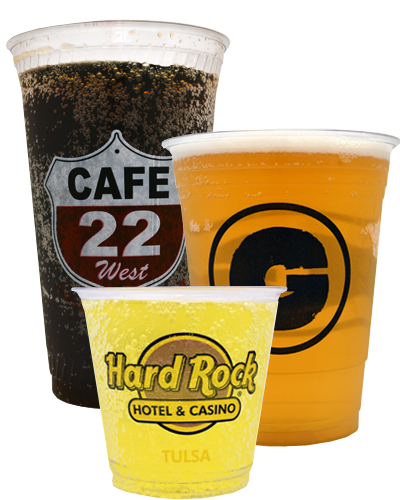 Enjoy all the power of brand recognition that comes from printing your company logo on these clear plastic cups without breaking the bank! Our custom printed Clear Plastic PET Cups are a great way to brand your company image! How many Clear Plastic PET Cups do I need to buy for a custom print? The minimum order requirement for Clear Plastic PET Cups is 5,000 cups. Price breaks are available for larger order quantities. What is the lead time for custom printed Clear Plastic PET Cups? The standard lead time for custom printed Clear Plastic PET Cups is 4-5 weeks. Transit time is typically 2 – 4 days for the East coast, and 5 – 7 days for the West coast. Clear plastic PET Cups can be printed with up to 3 spot PMS colors. We are able to match any PMS color on the chart. What kind of artwork is required for these plastic drinking cups? Vector art files are preferred. Adobe Illustrator, .EPS and high resolution PDF files work the best, however, if the line artwork is simple enough, sometimes a JPEG file will work. Bitmap images are not good enough quality for proof or plate making, and are not accepted. Need a price quote on custom printed Clear Plastic PET Cups? Contact us today! Love the clear plastic cup look, but need an even more durable as well as reusable cup for your event? 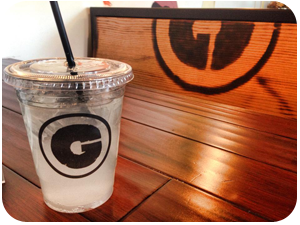 Check out our reusable custom printed clear plastic VS cups! These unique cups are reusable and dishwasher safe on the top rack!